We understand that after the funeral is the beginning of your future journey. We want to continue to support you as you embark upon this journey and are therefore very proud to announce that we are partners with SAIF Care. 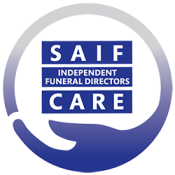 SAIF Care is a service offered by funeral homes that are members of The National Society of Allied and Independent Funeral Directors (SAIF). SAIF Care services are offered by friendly staff who are trained in counselling and bereavement skills and who will be able to listen and support you. SAIF Care Associate Counsellors are highly skilled and qualified. They will be able to help you to understand your experience of grief, develop self-care, coping strategies and support you to deal with the challenges you may be facing. SAIF Care is confidential and free of charge to people who have used our services.